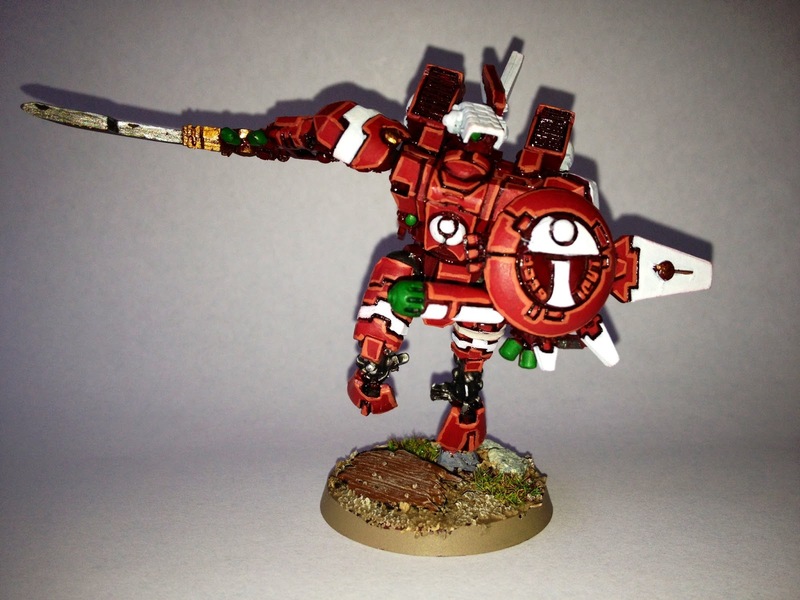 I’m struggling bit to get my head round the Farsight Supplement, specifically how it interacts with the Tau Codex. I was going to write a review of the Supplement, but I need to come to a view on this first. There has been some discussion on this over on Apostates Anonymous, but we haven't reached a conclusion. So, to aid understanding (! ), and to expose the discussion to a larger audience, I thought I would set out some thoughts here for discussion. I really welcome discussion on this topic, however, be nice! Logic, rules as written and courtesy are key – unsubstantiated conjecture on what the author intended, is not terribly helpful. I mostly play in tournaments and “but that's what it’s supposed to mean” doesn’t get you very far! So the question is – is a list which includes allies a “Farsight Enclave Army”, or is it simply a list with a Farsight Enclave Detachment (whether primary or allied)? It’s an important question. To use the above example – if a list with Farsight Primary and Tau Codex allies is a “Farsight Enclave Army” then XV8s taken in the Tau Codex Allied Detachment are troops. If a list with a Farsight Primary and Tau Codex allies is not a “Farsight Enclave Army” then XV8s can not be troops, even if taken in the Farsight Enclave Detachment. So, if you use rules from the Supplement, then you’re using a Farsight Enclave army. The problem is, that really doesn’t answer the question posed above. So, “army” is your whole force (to use a neutral term) consisting of both primary and allied detachments. If that’s right, doesn’t that mean a “Farsight Enclave Army” is an army taken entirely from the Farsight Supplement – i.e. with no allied detachments at all? As mentioned above, the most startling consequence of this is that, if you take any allies at all, your army is not a Farsight Enclave Army. If that’s right, by taking allies, you lose one of the biggest benefits of taking a Farsight list i.e. your XV8s can not be troops. I really want to be wrong about this, but the wording of the BRB and the Supplement makes it hard to come to any other conclusion. BTW – I’ve read some of the threads on this on ATT Dakka etc, and they don’t seem to come to a consensus. It may be there is just no answer in RAW and we need an FAQ. My gaming group has been using the NOVAOPEN FAQ as our guide for the supplement until everything is officially cleared up by GW. Firstly, it's possible that this is too simplified, but how I'd read it is: your army (primary detachment) is chosen using the dex and supplement, while your allies are only from the codex. Not sure how helpful this is, but they say kids have a simpler view on the world, and by blogging terms, I'm just a kid? do you actually think that a secondary i.e allied detachment gets the rules of the primary and also think that an army if it is the allied detachment gets it rules its allowed for being a primary detachment? Are you asking that if you have allies does your primary army stop having its "special" rules? What if we think of it from the other direction; is a Tau Empire Army the same as a Tau Empire detachment? If you take a Tau Empire detachment and, say, an Eldar detachment, is your army Tau Empire or Eldar? Pg. 109 of the main rulebook states: "[The Force Org Chart] dictates the units you can take in the main body of your army. All of the units in your primary detachment must be chosen from the same codex. Furthermore your Warlord must be chosen from your primary detachment." Pg. 110, for the double FOC: "All primary detachments must be taken from the same codex." Back on pg. 108: "a character from one of the army's HQ units must be nominated as the army's Warlord." So, I agree that it's a little ambiguous, because they don't seem to define "Army" by itself, apart from the overall force, but it seems to me that the detachment that you choose your Warlord from is your primary detachment, and the primary detachment is the umbrella under which your army operates. Basically, that's your army, and maybe it has some allies along to help out. So I'd read it as you take XV8s as troops so long as your warlord and primary detachment are chosen using the rules from the Farsight Enclaves, as then you're using an Enclaves army, no matter what your allies are. "A Farsight Enclaves army is chosen using the army list presented in Codex: Tau Empire. It also has a series of supplemental rules (presented below) that can be used in addition to the material found in Codex: Tau Empire. Note that you can only use the options from one codex supplement when choosing your army"
So it's still the Tau Codex we're using. These are just additional rules to that codex if we chose to run a Farsight Enclave. In Battlesuit Spearhead, you have to run one XV8 Crisis Team consisting of three models for it to be considered a Farsight Enclaves Army. So, you don't run it as an "allied attachment" for an already built Tau army. To run Farsight Enclave as an Allied detatchment, just make sure you tell your opponent and field a unit of 3 XV8 suits. Thanks all for your comments. I was going to post a reply, but I've just heard that the FAQ for the tourni I'm prepping for will allow Codex Sig Systems on Tau allied to Farsight enclave primary. Essentially they are reading "Farsight Enclave Army" as Farsight Enclave Detachment". And Im glad that is the ruling they are using, I've waited far to long to have crisis as troops to be teased with it now.